Almost 20% of patients with liver damage from mushroom (Amanita) poisoning and peak levels of total bilirubin greater than 2 mg/dL require liver transplantation or die, researchers report in the May issue of Clinical Gastroenterology and Hepatology. The authors show that peak level of aspartate aminotransferase (AST) below 4000 IU/L identifies patients who can be safely monitored in a local hospital, whereas patients with levels of bilirubin >2 mg/dL or AST >4000 IU/L should be transferred to a liver transplant center. Women and older patients were more likely to have a poor outcome than men and younger patients. Acute liver failure after toxic mushroom ingestion is a significant problem worldwide and in the United States. The genus Amanita accounts for more than 90% of fatal mushroom poisonings. Although exposures to toxic mushrooms often cause no or only mild symptoms, some patients develop severe hepatic necrosis and fulminant hepatic failure. There has been no reliable system to differentiate between patients who can be safely treated at a local hospital vs those that require transfer to a transplant center. Maurizio Bonacini et al collected data from 27 patients (15–82 years old) admitted to the emergency department within 24 hours of ingesting wild mushrooms. All presented with nausea, vomiting, abdominal cramps or pain, and diarrhea. They developed severe liver injury and were treated with activated charcoal and N-acetylcysteine at a medical center in San Francisco, California. Amanita phalloides was recognized by emergency department personnel as the specific culprit in 11 patients (41%); Amanita ocreata ingestion was documented for 3 patients (11%). Twenty-four of the patients ingested mushrooms with meals and 3 patients for hallucinogenic purpose. 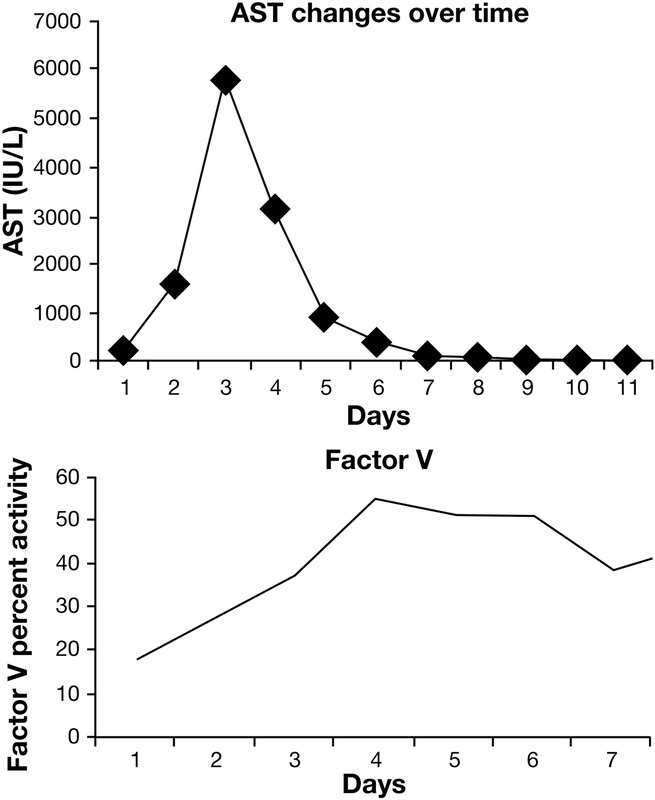 Level of AST and factor V activity, over time, in patients with toxic mushroom poisoning. Twenty-three patients were hospitalized for management of severe acute liver injury. At 24–48 hours after ingestion, the patients had peak serum levels of alanine aminotransferase (ALT) ranging from 554 to 4546 IU/L (median, 2185 IU/L). Acute renal impairment developed in 5 patients (19%), 4 of whom required continuous veno-venous hemofiltration. Hepatic encephalopathy (grades I to IV) developed in 9 patients. Twenty-three patients survived without liver transplantation, 1 woman underwent liver transplantation on day 20 after mushroom ingestion, and 3 women died of hepatic failure. Of the 23 patients with peak levels of total bilirubin of 2 mg/dL or more during hospitalization, 4 died or required liver transplantation. A peak serum level of AST <4000 IU/L identified patients with good outcomes (survival without need for liver transplant) with 100% positive predictive value; use of this cutoff would have saved 10 patients from a transfer to our tertiary center. Bonacini et al also found that a peak INR value of <2, or a nadir factor V cutoff ≥30%, would have avoided transfer for 7 and 6 patients, respectively. The authors state that mortality from toxic mushrooms is significantly higher than drug-induced liver injury (below 10%).